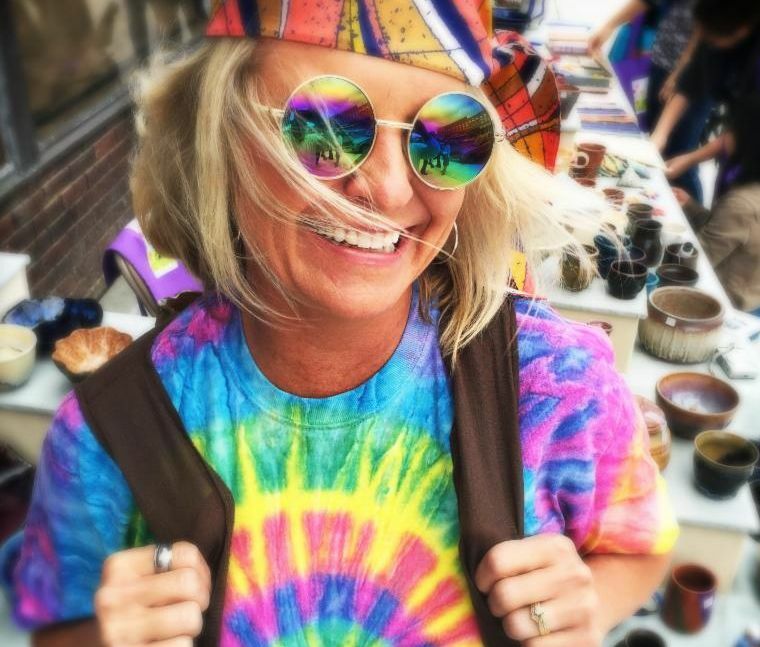 Kid's art projects, sidewalk sales, street art, music and food will all be part of the groovy good time had at the 2019 Lindsborg in Bloom, Saturday April 27th from 10:00 AM tp 4:00 PM. Celebrating all things 60's, guests are invited to dress the part! Break out your favorite bell bottoms, your best psychedelic tie-dye, or the brightest flower-power outfit you own and join in the fun! 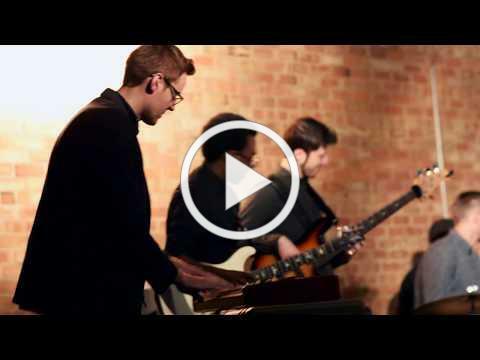 Beginning at 7:00 PM, enjoy the opening of the 2019 Lindsborg Jazz Walk at Connected Fair Trade, 129 N Main, and at the Blacksmith Coffee Shop, 122 N Main. Later in the evening, smaller groups will combine for a New Orleans style march to the J.O. Sundstrom Conference Center, where spectators can sit and enjoy Jazz in concert. Families are encouraged to bring their children. An area designated for kids to draw what they see and hear will be provided! This years special guest will be Miles Bonny, a trumpeter, vocalist, producer, disc jockey, and community empowerment worker. Miles is a distant relative of Emory Lindquist, president of Bethany College from 1943–1953 and author of several books about Lindsborg and Lindsborg people. 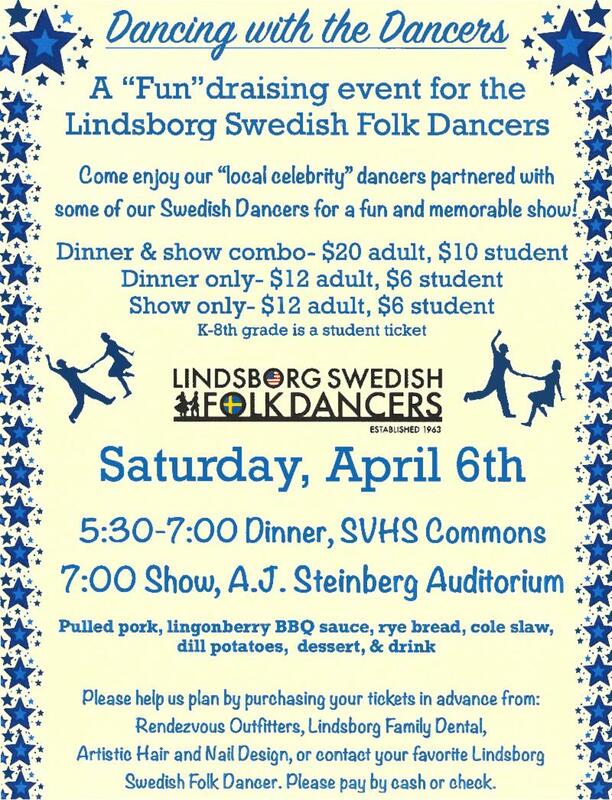 With a nod to the Lindsborg's 150th anniversary, Emory Lindquist's daughter will be attending the Jazz Walk as a special guest of Mr. Bonny's. Miles' explorations in social issues and world cultures has taken him on numerous tours in Europe, invited him into collaborations addressing drug abuse with artists in Russia and fatherhood in Italy, random excursions including time in Sweden with Diplo, and Australia with Osunlade and Ta-Ku. Whether rubbing shoulders as child with Tito Puente, Max Roach, Carmine Caruso, Vic Damone, and Michael Brecker or as a collaborator with many in the international DJ, Vinyl, Beat, and Soul scenes as an adult, Miles has stayed in the fold of not only music but culture. Stay tuned, more information about the Jazz artists joining Miles in the Jazz Walk and the special music industry masterclass that afternoon will be coming to the Lindsborg Landmark Concert Series Facebookpage. Don't miss the Lindsborg Collects edition of Makers Street, Friday, April 12, from 5:00 PM to 8:00 PM. Lindsborg Collects, Lindsborg Art is pop-up exhibit that began in 2013. Each year a call goes out to the Smoky Valley Community requesting pieces of art made by Bethany College Students or Lindsborg residents along with the story behind those favorite and unusual works of fine art or crafts. Stay tuned for the line-up of stops and follow Makers Street - The Lindsborg Art Walk on Facebook to learn more. New to the Messiah Festival of the Arts this year, is the Palm Sunday event. This immersive experience will feature music performed by area high schools and the Bethany Oratorio Society, B. G. Gröndal images of historically significant Smoky Valley people and places, and dramatic readings of letters, diaries and other significant writings throughout Lindsborg's history. Come celebrate the Smoky Valley Sunday, April 14 at 3:00 PM. Tickets are $10.00 online or $13.00 at the door. Come hear the Hallelujah! 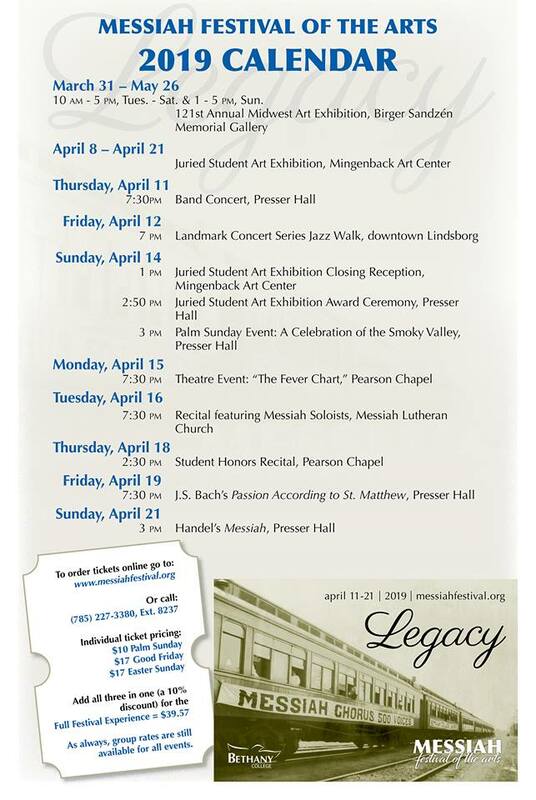 The 138th Messiah Festival of the Arts begins April 11 th . Learn more about this year's performers here . Tickets are now available to purchase online . Bundle up and save by purchasing tickets for the Palm Sunday Performance, Bach's "Passion According to St. Matthew" performance, and Handel's "Messiah" performance all at once. Even better, attend all three events and receive a 2019 Messiah Festival of the Arts poster signed by the Messiah soloists! 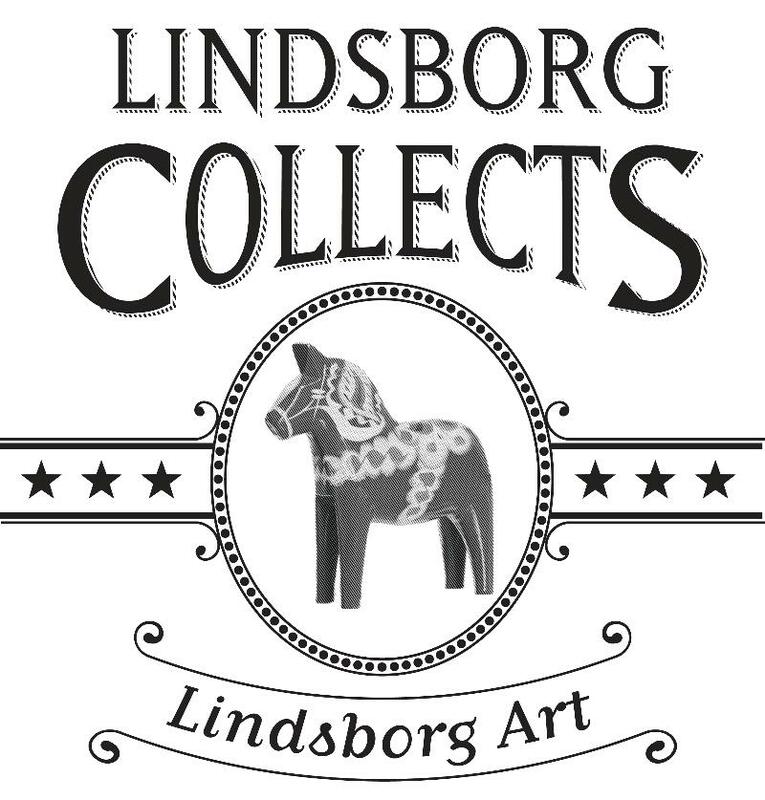 The seventh annual “Lindsborg Collects…Lindsborg Art” exhibition will celebrate local art collectors at 105 N Main St, Lindsborg, beginning March 24 th through April 21 st . The exhibit will be open Fridays, Saturdays, and Sundays from 1:00 PM to 5:00 PM and on Easter day from 1:00 PM to 6:00 PM. A reception will be held Sunday, March 24 th from 3:00 PM to 6:00 PM. Additionally, the exhibition will be open during Lindsborg’s Makers Street Artwalk on Friday, April 12 thfrom 5:00 PM to 8:00 PM. Favorite and unusual works by local artists from collectors in the 67456 zip code will be on display. Stories submitted by collectors will be displayed along with artwork during the exhibition. This exhibition is free to the public. For more information contact the Raymer Society at raymer@redbarnstudio.org or call 785-227-2217. The public is invited to the grand opening of the new Photo Art gallery, featuring an exhibition called "Kansas Metal Show " with photos by Greg Wagner printed on sheet metal as both single images and mosaics. Additional images will be shown in a large digital format. A limited number of each print will be available for purchase. Photo Art Gallery is located at 120 West Lincoln Street in Lindsborg. Hours are Friday and Saturday, from 4:00 PM to 8:00 PM, and Sunday from 4:00 PM to 6:00 PM. Time flies when you're having fun! Hands of Time will soon celebrate it's one-year anniversary. Join owners Dawn and Brandon Sherwood and enjoy cocktails, food, confetti, and new art, Saturday, April 13, from 6:00 PM to 9:00 PM. Hands of Time Galley is located at 118 S Main Street in Lindsborg. The Orfeo Trio will perform at the Birger Sandzén Memorial Gallery on Friday evening, April 5 th , at 7:00 PM. The concert is a part of the Sandzén Gallery's 2018-19 chamber music series. 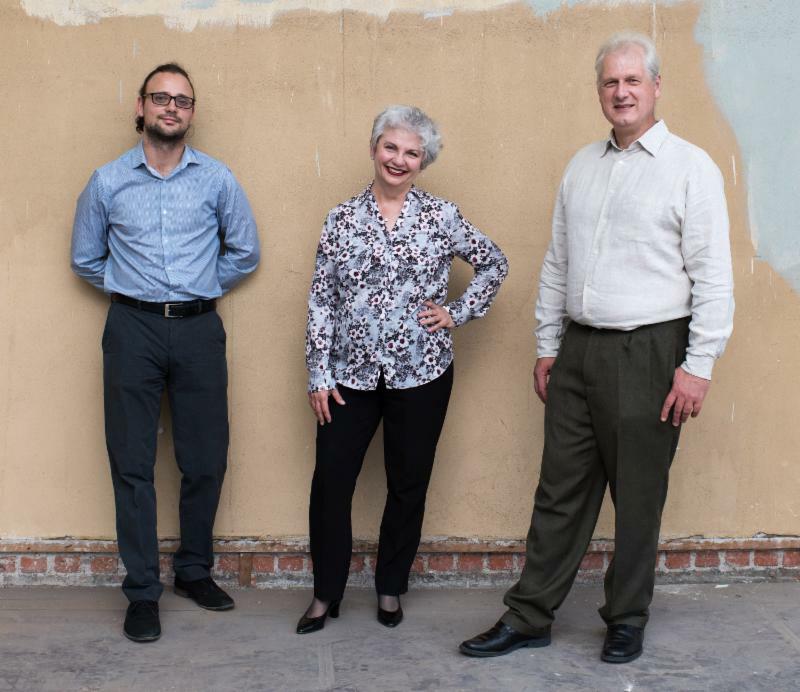 The Orfeo Trio was formed in 2012 in Wichita, Kansas, where they began their career as the official Piano Trio of the Wichita State University College of Fine Arts School of Music. They have toured internationally, including performances in Malaysia, Thailand, and China. All three members of the Orfeo Trio are active performers with considerable chamber music experience. Cellist Leonid Shukaev is a founding member of the St. Petersburg String Quartet, which was in existence for thirty years, and is presently a tenured associate professor at Wichita State University and principal cellist in the Wichita Symphony. Violinist Evgeny Zvonnikov, the youngest member of the Trio, was second violinist for four years in the St. Petersburg String Quartet and Associate Concertmaster of the Wichita Symphony Orchestra for five years. He teaches violin at Texas A&M University in Canyon, Texas, plays second violinist in the Harrington String Quartet, and is concertmaster of the Wichita Grand Opera orchestra. ﻿Pianist Julie Bees is an active recitalist in the U.S., Europe, and Asia, and has appeared as soloist with orchestras in Hong Kong, Dallas, New York, Santa Barbara, Augusta, and Interlochen. She joined the piano faculty of Wichita State University in 1986. The Sandzén Gallery is located at 401 North First Street in Lindsborg. There is no charge for the concert, however, donations are appreciated. For further information, please call the Gallery at 785-227-2220 or email fineart@sandzen.org . Karla Prickett will be the Artist-in-Residence from April 2 nd through Sunday, April 14 th at the Red Barn Studio Museum , 212 S Main Street, Lindsborg . During Karl a Prickett’s residency, she will be “creating new works, specifically mixed media collage on canvas.” She strives to “create compositions which incorporate hand cut elements specifically selected to contribute line, color, form and movement.” In addition to being an artist, Karla Prickett is a visual arts consultant. Retired as Visual Arts Director with Salina Arts and Humanities in 2014, Karla is an exhibition committee member at both the Salina Art Center and the Birger Sandzén Memorial Gallery in Lindsborg. Karla’s works are in private collections and the Emprise Bank Collection in Wichita. For more information, contact the Red Barn Studio Museum at 785 227-2217 or raymer@redbarnstudio.org The Red Barn Studio is open Tuesday through Friday, from 10:00 AM to 5:00 PM, and Saturday and Sunday from 1:00 PM to 5:00 PM. 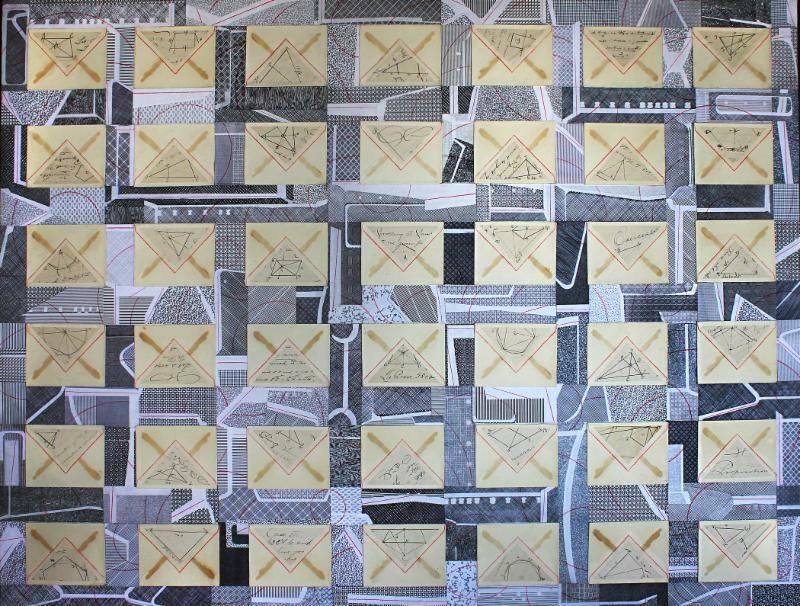 Four new exhibitions comprise the 121 th annual Midwest Art Exhibition , which opens at the Birger Sandzén Memorial Gallery on Sunday, March 31, 2019. On display through May 26 are paintings by Mark Flickinger of Arkansas City, along with three shows primarily from the Sandzén Gallery's permanent collection: Presentation Prints of the Woodcut Society, 1932-1954 , Celebrating Lindsborg Art , and wood-burned Sloyd furniture. The reception for the exhibitions will be Sunday, March 31, 2019, from 2:00 PM to 4:00 PM with gallery talks beginning at 2:30 PM. The Midwest Art Exhibition was founded in 1899 by three local Lindsborg artists – Birger Sandzén, Carl Lotave, and G. N. Malm – as a complement to the annual Messiah Festival held at Bethany College. It represents the longest running annual art exhibition in Kansas. In celebration of Lindsborg's 150 thanniversary, the Gallery is presenting a selection of works from its permanent collection by artists who have called Lindsborg home. The exhibition will feature paintings, drawings, prints, sculpture, and ceramics by nearly 70 artists and spans twelve decades. 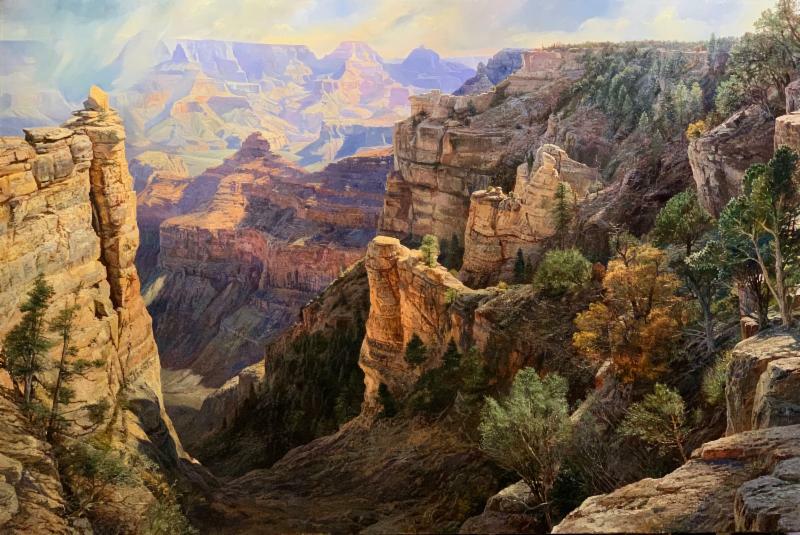 Mark Flickinger is a painter and teacher at Cowley College in Arkansas City, Kansas, who is known for his exquisitely-detailed landscape paintings. He earned an M.F.A. at Indiana University and B.F.A. at Wichita State University and has participated in exhibitions throughout the country. Additionally, he has done commissions and painted murals extensively throughout the region. He writes, "Painting always begins as a response. Outside in the light and air, full of every detail and movement, I at once find and lose myself. It is important for me to be in the landscape and experience the light, weather, and changing nature of the place. I paint studies on location and ultimately try to show my love for color, paint, texture, space, air, and light. I have a compulsion to paint and be in these places." One of the exhibitions from the Gallery's permanent collection is a display of the complete set of Woodcut Society membership prints in their original presentation folders. The 44 blockprints were created by an international cast of 32 artists and reveal a wide variety of subject matter and technique. In 1932, Kansas City grain merchant Alfred Fowler established the Woodcut Society with the sole aim of increasing “interest in fine woodcuts as a medium of artistic expression.” He planned to commission and publish two new woodcut print editions each year, proposing a subscription-based organization limited to 200 members. For $10 in dues per year, each would receive impressions mounted in a presentation folder. The Woodcut Society offerings were geared toward print collectors, and intended to be savored in the intimate setting of one’s private library. The final exhibition, Sloyd Furniture , will showcase pyrography (wood burned) pieces from the early 1900s completed by Birger Sandzén, Amalia Rabenius, and G. N. Malm. A program in Sloyd was begun at Bethany College near the turn of the last century and continued for a number of years. One aspect of the program focused on pyrography, which is the art of decorating wood or other materials with burn marks. Dr. Marlysue Holmquist has written about the program stating "the word Sloyd , also spelled Slojd , is an English translation of the Scandinavian word Slog which means skilled hand work. Sloyd refers to the making of objects for daily use in the home, including weaving, clothing, kitchen and eating utensils, decorative items, and tools." The Sandzén Gallery is located at 401 North First Street in Lindsborg. Hours are 10:00 AM to 5:00 PM, Tuesday through Saturday, and 1:00 PM to 5:00 PM on Sunday. Admission is free, with donations appreciated. Docent tours for groups are available by two-week advance appointment. For more information about Birger Sandzén, the Gallery, and these exhibitions visit the website www.sandzen.org, or call (785) 227-2220. Want to learn more? Sign up for our mailing list!